Coach Holidays & Short breaks in the United Kingdom & Europe. 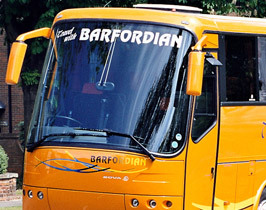 At Barfordian we pride ourselves on our coach holidays. We have spent many years selecting the best destinations and believe in giving you the best value for money possible. That's why you'll find most Day Excursions are included in the cost of your coach holiday plus many extras such as boat trips, train rides, cream teas, visitor attractions, local guides etc. Our coach holidays are listed below, you can also download our brochures.